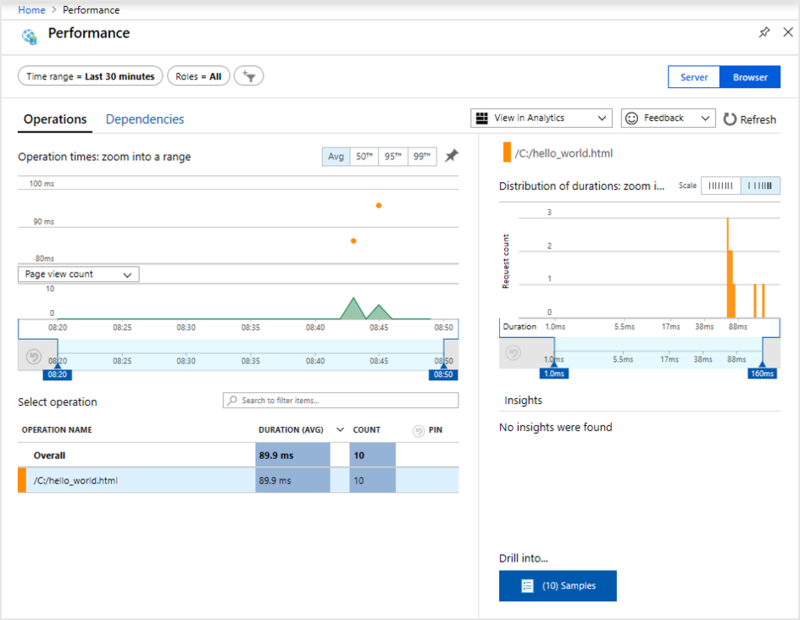 With Azure Monitor Application Insights, you can easily monitor your website for availability, performance, and usage. You can also quickly identify and diagnose errors in your application without waiting for a user to report them. Application Insights provides both server-side monitoring as well as client/browser-side monitoring capabilities. You need an Azure Subscription. Application Insights can gather telemetry data from any internet-connected application, running on-premises or in the cloud. Use the following steps to start viewing this data. A configuration box appears; use the following table to fill out the input fields. On your local computer, create a file called hello_world.html. For this example the file will be placed on the root of the C: drive at C:\hello_world.html. Select Overview > Essentials > Copy your application's Instrumentation Key. Edit hello_world.html and add your instrumentation key. Open hello_world.html in a local browser session. This will create a single pageview. You can refresh your browser to generate multiple test page views. Go back to the Overview page. Click on Browser from under the Investigate header, then select Performance Here you find metrics related to the performance of your website. There is also a corresponding view for analyzing failures and exceptions in your website. You can click Samples to drill into individual transaction details. From here, you can access the end-to-end transaction details experience. 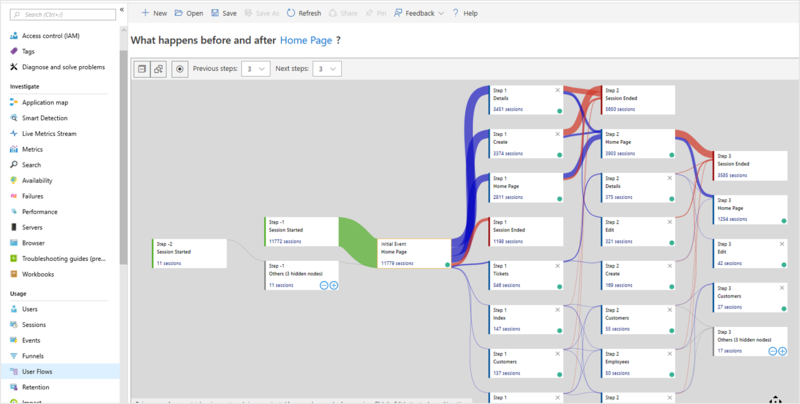 If we had instrumented a more complex website with multiple pages, another useful tool is User Flows. With User Flows you can track the pathway visitors takes through the various parts of your website. If you plan to continue on to work with subsequent quickstarts or with the tutorials, do not clean up the resources created in this quickstart. Otherwise, if you do not plan to continue, use the following steps to delete all resources created by this quickstart in the Azure portal. From the left-hand menu in the Azure portal, click Resource groups and then click myResourceGroup. On your resource group page, click Delete, type myResourceGroup in the text box, and then click Delete.